David P. Moss, MD, is an orthopaedic surgeon specializing in conditions and disorders of the hand, wrist, and elbow. He completed his residency at NYU-Hospital for Joint Diseases, and his fellowship at The Curtis National Hand Center in Baltimore, after attending medical school at Medical College of Virginia, VCU School of Medicine in Richmond. 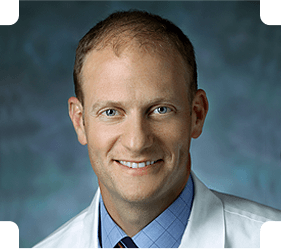 Dr. Moss grew up in McLean, Va. and completed his undergraduate studies at Princeton University. Dr. Moss' research interests include tennis elbow, carpal tunnel syndrome, and post-operative pain relief. He currently lives in Washington, D.C., with his wife and children. He enjoys playing squash and golf. Dr. Moss is board certified by the American Board of Orthopaedic Surgery. DP Moss, CL Forthman. "Ulnar Artery Thrombosis Associated with Anomalous Hypothenar Muscle." Journal of Surgical Orthopaedic Advances, 17(2):85-8; 2007. DP Moss. "Total Elbow Arthroplasty: Indications, Surgical Technique, Outcomes." Presented at 27th Annual Cherry Blossom Seminar, Washington, DC, 2008. DP Moss, CL Forthman. "A Biomechanical Comparison of Locking Screws Used in Volar Fixation of Distal Radius Fractures: How Many Screws are Necessary?" Presented at The George Washington University Health Sciences Research Day, Washington, DC, 2008. DP Moss, K Segalman. "Metacarpal and Phalangeal Fractures." In: Hand and Upper Extremity Reconstruction, KC Chung (ed.). Elvesier Publications, London, 2008. DP Moss, CL Forthman. "A Biomechanical Comparison of Locking Screws Used in Volar Fixation of Distal Radius Fractures: How Many Screws are Necessary?" Presented at E.F. Shaw Wilgis Lectureship in Hand Surgery, Baltimore, 2007. DP Moss, CL Forthman. "A Biomechanical Comparison of Locking Screws Used in Volar Fixation of Distal Radius Fractures: How Many Screws are Necessary?" Presented at Union Memorial Hospital Author's Day Presentations, Baltimore, 2007. DP Moss, NT Tejwani: "Biomechanics of External Fixation: A Review of the Literature." Bulletin of Hospital for Joint Diseases; 65(4):294-299, 2007. DP Moss, KB Raskin: "Bone Tumors: Benign and Malignant." In: Core Knowledge in Orthopaedics: Hand, Elbow, Shoulder. Trumble TE (ed. ), Elvesier Publications, 2005. DP Moss, "Damage Control Orthopaedics and Spanning External Fixation." Presented at Grand Rounds, Hospital for Joint Diseases, 2006. DP Moss, JR Rudzki, JC Wittig, R Henshaw, MM Malawer. "Minimally Invasive Burr-Down Technique versus En Bloc Resection for Treatment of Osteoid Osteoma: Results From a Single Institution Over a 20 Year Period." Presented at American Academy of Orthopaedic Surgeons Annual Meeting, 2001. J Bickels, N Kahanovitz, CK Rupert, RM Henshaw, DP Moss, I Meller, MM Malawer. "Extraspinal Bone and Soft-Tissue Tumors as a Cause of Sciatica." Spine; 24(15):1611-1616, 1999. J Bickels, N Kahanovitz, CK Rupert, RM Henshaw, DP Moss, I Meller, MM Malawer. "Extraspinal Bone and Soft-Tissue Tumors as a Cause of Sciatica." Presented at Combined Meeting of the American and European Musculoskeletal Tumor Societies, 1998, and North American Spine Society's 13th Annual Meeting, 1998. DP Moss: Cycloaromatization Studies of a Potential Anti-Cancer Prodrug.Princeton University Thesis, 1996. LM Schulte, DP Moss. "Intra-Operative Conversion from Open Reduction and Internal Fixation to Total Elbow Arthroplasty for Distal Humerus Fractures: A Case Report and Surgical Technique." Submitted to Journal of Orthopaedic Trauma, 2010. DP Moss, CL Forthman. "A Biomechanical Comparison of Locking Screws Used in Volar Fixation of Distal Radius Fractures: How Many Screws are Necessary?" Submitted to Journal of Hand Surgery, 2008. DP Moss. "Treatment of Zone I Flexor Tendon Lacerations: A Biomechanical Cadaveric Comparison of Suture Repair versus Teno Fix Tendon Repair System." Hospital for Joint Diseases, 2006. DP Moss, N Tejwani. "Damage Control Orthopaedics and Spanning External Fixation." Submitted to Journal of the American Academy of Orthopaedic Surgeons, 2006. CK Rupert, DP Moss, MM Malawer. "Acetabular Reconstruction for Metastatic Carcinoma Without Replacing the Hip Joint: Description of a New Prosthetic Device and Surgical Technique." Washington Hospital Center, 1999. DP Moss, RM Henshaw, MM Malawer. "Efficacy of Pain Control with Epineural Catheter versus Epidural Catheter for Post-Operative Patients, Gauged by Catecholamine Levels and Narcotic Use." Washington Hospital Center, 2000. DP Moss, MA Armstrong. "Correlation of Brain Atrophy with Clinical Disease in HIV-Infected Juveniles." The National Institutes of Health, 1993.
International humanitarian program that provides surgical and non-surgical treatment of complex upper extremity disorders. Mentor, tutor, squash instructor, team physician for underprivileged urban youth.